Mumbai: New disclosure norms, a cap on charges for unit-linked insurance plans, or Ulips, and a likely cut in agents’ commission could change the face of the life insurance industry in 2010, even as the first initial public offering (IPO) by a life insurer may hit the market. Though most private insurers are yet to make profits, some of them have drawn up a road map for IPOs. Reliance Life Insurance Co. Ltd has announced its plan for an IPO and is awaiting regulatory clearance. Bigger rivals such as ICICI Prudential Life Insurance Co. Ltd and HDFC Standard Life Insurance Co. Ltd are expected to hit the market in 2011. The insurance regulator may allow life insurance firms to float an IPO after completing five years of business, halving the current norm of 10 years as a precondition for entering the capital market. India in 2000 opened up the industry, which now has 23 insurers. The state-owned insurer collected premiums worth Rs30,471.11 crore from new customers in the seven months to October, giving it a 65% share of the market—impressive, yet 14 percentage points less than the 79% share it had in October 2006. The industry now has close to Rs10 trillion worth of assets. In fiscal 2000, before the private insurers entered the scene, the new premium income for the industry was Rs8,299 crore. It rose to Rs93,713 crore in fiscal 2008, but dropped to Rs86,866 crore in fiscal 2009 when the stock market slumped after an unprecedented credit crunch hit the global financial system. But the industry is back again on a high growth track, collecting new business premiums worth Rs46,551 crore between April and October, recording 18% growth compared with the corresponding period last year. “The growth will continue at 18-20% in terms of total premium collections. In the coming decade, we will see costs coming down tremendously for the companies," said S.B. Mathur, secretary general, Life Insurance Council, a national industry lobby. According to him, at least four companies are planning to float IPOs in the next two years. The private players had begun their business focusing on volumes and expansion. In the race for larger market share, they have kept on infusing capital but the focus was rarely on disclosure. From 2010, they will have to make public critical data on claims, investments, solvency, expenses, related party transactions, non-performing assets and losses, etc.—this will force them to shift their focus from business volume and market share to profitability. Private insurers have already started curbing capital infusion by reducing their expenses and increasing their renewal premium. “The new mantra for the life insurance industry will be profitable growth and not just growth," said Deepak Satwalekar, former managing director of HDFC Standard Life Insurance. This, according to him, will lead to changes in the distribution model, marketing initiatives and pricing of products. A recent Life Insurance Council report said the industry’s renewal premium has grown from Rs17,951 crore in fiscal 2000 to Rs1.33 trillion in fiscal 2009. In April-October, this has increased by around 24%. Renewal premium is the premium collected on the renewal of existing policies. Growth in renewal premium indicates the stickiness of existing policyholders and lower acquisition costs. This, in turn, helps an insurer in making business profitable faster. Mathur said that in an effort to keep costs under control, companies will focus on retaining longer-term policies, innovate their product mix and restructure their distribution channels. “The focus has already shifted from agency distribution channel to bancassurance, but the benefit out of this is yet to be extended to the policyholders. This rationalization has to come sooner than later," he added. Bancassurance refers to the business model of selling insurance policies through bank branches. According to a recent report by Edelweiss Securities Ltd, during 2009, the impact of lower Ulip sales was felt more by private insurers as they started consolidating their distribution infrastructure, to align operating efficiencies to long-term operating assumptions. “The massive expansion drive appears to have come to a halt for now, with focus shifting to channel productivity and carving out new distribution relationship," the report said. According to Satwalekar, life insurance companies will now have to “spend time on enabling their sales force to provide advice and not just engage in sales". This will become critical when the financial sector moves to an advisory model from the existing agency model. Large private insurers such ICICI Prudential Life, SBI Life Insurance Co. Ltd, HDFC Standard Life and Kotak Mahindra Old Mutual Life Insurance Ltd either maintained or reduced the number of agents and branches, while Reliance Life Insurance intends to add 70 branches and around 5,000 agents per month. Birla Sun Life Insurance Co. Ltd is set to add around 40,000 agents by March. A June report on Indian financial services by Bank of America-Merrill Lynch said private insurers are likely to continue gaining market share from LIC through expansion in distribution and products. “The first-year premium during FY09, especially on an APE (annualized premium equivalent) basis, contracted by 7% for the entire sector. While this was led in part by LIC, a government company, the private sector premium growth also fell to 5% as ICICI Prudential and Bajaj Allianz, the largest players, had pulled back on growth," the report said. According to the report, much of the growth was driven by Reliance Life Insurance, SBI Life Insurance and Birla Sun Life. While the introduction of equity-oriented life policies provided a level-playing field for the industry vis-à-vis the mutual funds industry, this has also contributed to the greater penetration of insurance and the growth of equity markets and infrastructure during the decade. The industry invested nearly Rs51,562 crore in domestic equities during fiscal 2009 when foreign institutional investors, the main driver of the Indian stock market, pulled out Rs47,345 crore and mutual funds bought stocks worth Rs7,000 crore. 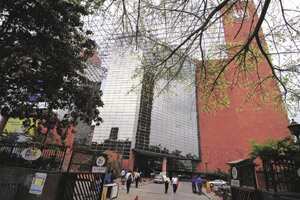 LIC alone plans to invest in excess of Rs50,000 crore in equities during the year ending March. Satwalekar said that one of the most significant contributions of the life insurance industry during this decade has been in introducing equities as a class of savings instruments to build up financial security. “The life insurance (industry) did more for the equities market and for the middle-class saver, in all cities and towns, than the mutual fund industry did in its entire existence," he said. Taking the cue from a move by the capital market regulator, the Securities and Exchange Board of India to scrap the entry load for mutual fund investments and bring the commission structure under investors’ discretion, a committee headed by Pension Fund Regulatory and Development Authority chairman D. Swarup recommended scrapping agents’ commission for insurance products. Neither life insurance firms nor the insurance regulator, the Insurance Regulatory and Development Authority, are happy with the suggestion. The government is set to take a call on this contentious issue sometime in 2010. If it is accepted, consumers will get the benefit but the industry may see a slump in sales, at least initially, as their distributors may not be enthused about selling insurance products. Distributors earn around 15% commission in the first year for selling traditional products, while commission for Ulips can be as much as 40%. The insurance regulator capped fund management charges for Ulips in July and said the maximum difference between gross and net returns on such products cannot exceed 3 percentage points. Capping of fund management charges and squeezing the difference in yields have prompted many insurers to increase the minimum ticket size of Ulips. The other option before them is to cut expenses drastically, as otherwise profitability will be hit. The minimum lock-in period for such products has also been raised from three years to five years. Capping Ulip charges, which will come into effect from January, will force private insurers to sell more traditional policies. This, analysts say, will benefit the industry in the long term. In April-October, private insurers such as Bajaj Allianz, HDFC Standard Life, Kotak Mahindra and SBI Life increased traditional plans in their incremental product mix and this trend will gain momentum in 2010.